, prince of Savoy, an illustrious general, was born in 1663, and descended from Carignan, | one of the three branches of the house of Savoy. His father was Eugene Maurice, general of the Swiss and Grisons, governor of Champaigne in France, and earl of Soissons; his mother donna Olympia Mancini, neice to cardinal Mazarin. In 1670 he was committed to the tuition of a doctor of the Sorbonne; but his father dying before he was ten years of age, after the French king had given him the grant of an abbey as a step to a cardinal’s hat, and the government of Champaigne being given out of his family, occasioned an alteration in his intended profession; which was indeed by no means suitable to his genius, although he gave great and early hopes of proficiency in the belles lettres, and is said to have been particularly fond of Curtius and Cæsar. He was a youth of great spirit, and so jealous of the honour of his family, that when his mother was banished by the king’s order from the French court to the Low Countries, soon after her husband’s decease, he protested against the injustice of her banishment, and vowed eternal enmity to the authors and contrivers of it. After being for a time trained to the service of the church, for which he had no relish, he desired the king, who maintained him according to his quality, to give him some military employment. This, however, was denied him, sometimes on account of the weakness of his constitution, sometimes for want of a vacancy, or a war to employ the troops in. 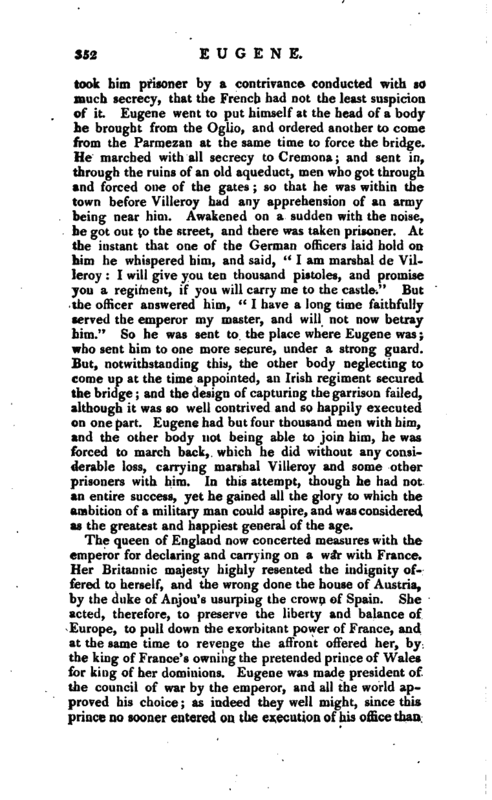 Apprehending from hence that he was not likely to be considered so much as he thought he deserved in France, and perceiving that he was involved in the disgrace of his mother, he resolved to retire to Vienna with one of his brothers, prince Philip, to whom the emperor’s ambassador had, in his master’s name, promised a regiment of horse. They were kindly received by the emperor; and Eugene presently became a very great favourite with his imperial majesty. He had in the mean time many flattering promises and invitations to return to France; but his fidelity to the emperor was unshaken, and he resolved to think no more of France, but to look on himself as a German, and to spend his life in the service of the house of Austria. When these two brothers arrived in Germany, the Turks were descending upon the Imperialists, in order to make an irruption into the hereditary country. There prince Philip received his death’s wound by the fall of his horse, after he had gallantly behaved himself in a skirmish with | the Turks, and left his command to his brother Eugene. This prince, in 1683, signalized himself at the raising of the siege of Vienna, where he made a great slaughter of the Turks, in the presence of John III. king of Poland, the elector of Bavaria, John George III. elector of Saxony, Charles V. duke of Lorrain, Frederic prince of Waldeck, Lewis William margrave of Baden, and many other great men, of whom he learned the art of war. After raising the siege of Vienna, it was resolved not to give the Turks time to recollect themselves. The project was laid to reduce the most important fortresses in Hungary: and the next year, 1684, he again distinguished himself at the sieges of Newhausel and Buda. He behaved so gallantly at the siege of Buda, that the duke of Lorrain wrote a letter in his commendation to the emperor. He was constantly in the trenches, and one of the first who entered the town sword in hand: and at their return to Vienna, when Newhausel was taken, the duke presented him to the emperor in these words, “May it please your majesty, this young Savoyard will some time or other be the greatest captain of the age:” which prophecy, it is universally agreed, was afterwards fulfilled. His imperial majesty caressed him upon all occasions, and had that firm and wellgrounded confidence in his merit, that when Buda was taken, and the army gone into winter quarters, he invested him with the chief command of his troops, during the absence of the supreme officers. Thus he rose daily in the favour of the court of Vienna; and every campaign was only a new step in his advancement to the first military offices. In 1688 Belgrade was besieged and taken; where Eugene, who was always among the foremost in any onset, received a cut through his helmet by a sabre, but repaid the blow by laying the Turk who gave it him dead at his feet. 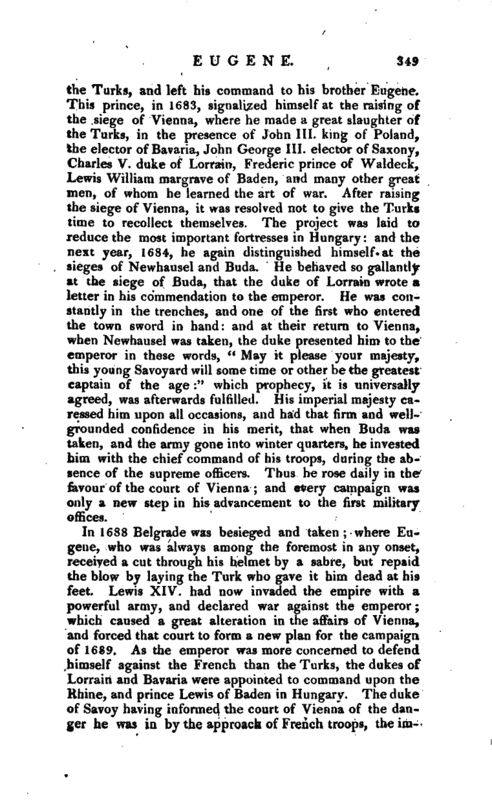 Lewis XIV. had now invaded the empire with a powerful army, and declared war against the emperor; which caused a great alteration in the affairs of Vienna, and forced that court to form a new plan for the campaign of 1689. As the emperor was more concerned to defend himself against the French than the Turks, the dukes of Lorrain and Bavaria were appointed to command upon the Rhine, and prince Lewis of Baden in Hungary. 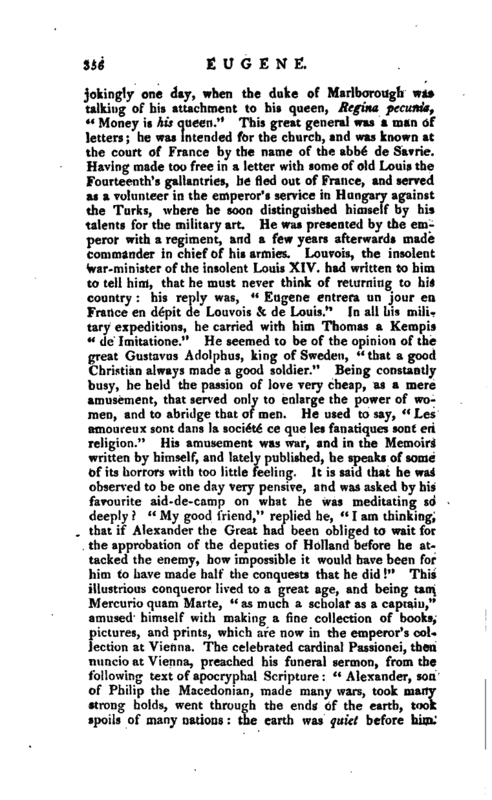 The duke of Savoy having informed the court of Vienna of the danger he was in by the approach of French troops, the | imperial ministers promised themselves great advantages from the war in Italy, on the account of the powerful diversion that his royal highness might be able to make there in favour of the empire. Eugene was intrusted by the court of Vienna to manage this expedition; and was thought the most proper person, not only because he was related to the duke of Savoy, but because of the vast reputation he had lately acquired in Hungary, which rendered him yet more acceptable to his royal highness, who received him with all the marks of sincere friendship. Accordingly, he took upon him the command of the emperor’s forces in Italy, and blocked up Mantua, which had received a French garrison, of whom he killed above 500 in several sallies: so that during 1691 and 1692 they never durst attempt the least excursion. 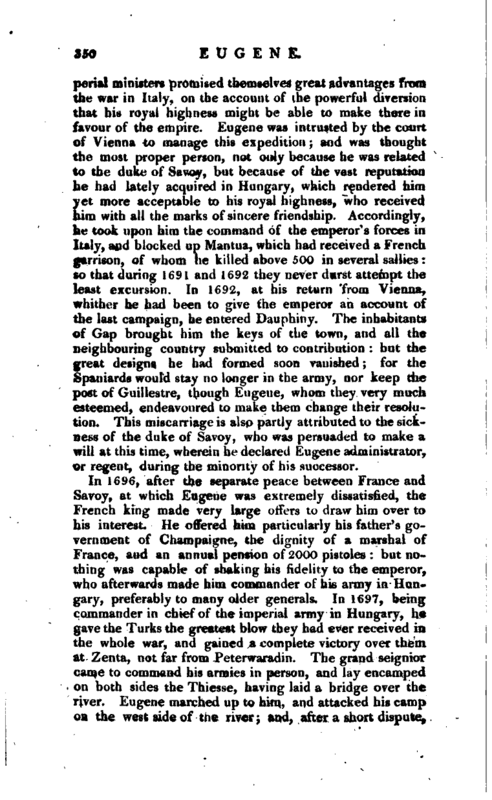 In 1692, at his return from Vienna, whither he had been to give the emperor an account of the last campaign, he entered Dauphiny. The inhabitants of Gap brought him the keys of the town, and all the neighbouring country submitted to contribution: but the great designs he had formed soon vanished; for the Spaniards would stay no longer in the army, nor keep the post of Guillestre, though Eugene, whom they very much esteemed, endeavoured to make them change their resolution. This miscarriage is also partly attributed to the sickness of the duke of Savoy, who was persuaded to make a will at this time, wherein he declared Eugene administrator, or regent, during the minority of his successor. 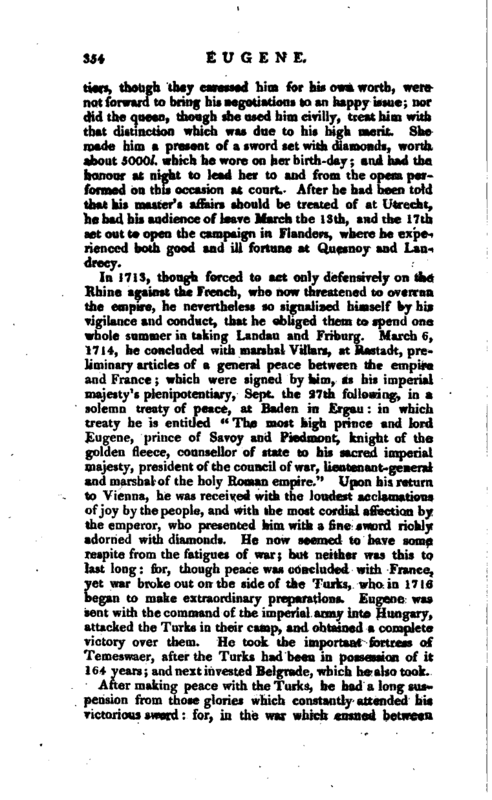 In 1696, after the separate peace between France and Savoy, at which Eugene was extremely dissatisfied, the French king made very large offers to draw him over to his interest. 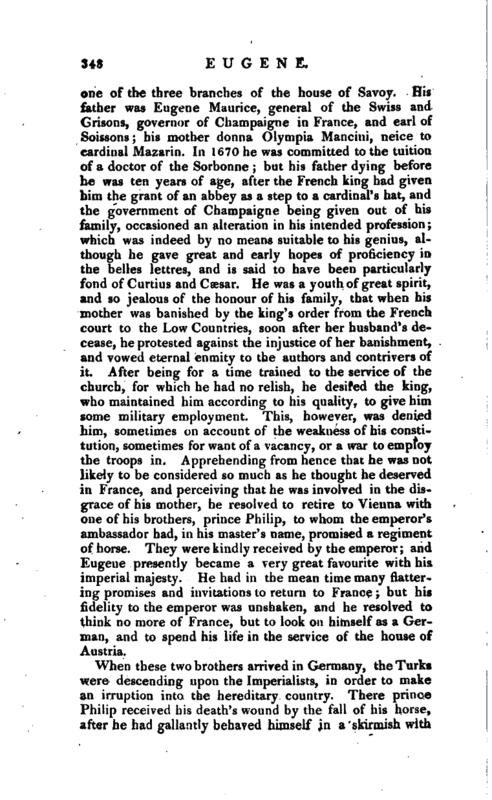 He offered him particularly his father’s government of Champaigne, the dignity of a marshal of France, and an annual pension of 2000 pistoles: but nothing was capable of shaking his fidelity to the emperor, who afterwards made him commander of his army in Hungary, preferably to many older generals. In 1697, being commander in chief of the imperial army in Hungary, he gave the Turks the greatest blow they had ever received in the whole war, and gained a complete victory over them at Zenta, not far from Peterwaradin. The grand seignior came to command his armies in person, and lay encamped on both sides [of] the Thiesse, having laid a bridge over the river. Eugene marched up to him, and attacked his camp on the west side of the river; and, after a short dispute, | broke in, made himself master of it, and forced all who lay on that side over the river, whither he followed them, and gave them a total defeat. In this action the Germans had no more than 430 men killed, and 1583 wounded: but of the Turks 22,000 were killed in the field, among whom were the grand visier, and the aga of the janisaries; 10 or 12,000 were drowned in the Thiesse, and 6000 wounded and taken prisoners, among whom were 27 pashas, and several agas. The Imperialists took 9000 laden waggons, after 3000 had been thrown into the river; the grand seignior’s tent, valued at 40,000 livres, with all the rest belonging to his army; 17,000 oxen, 6000 camels, all heavy laden; 7000 horses, 100 heavy cannon, and 70 field-pieces, besides 500 drums, and as many colours, 707 horses tails, 83 other standards, a scymitar of inestimable value, the sultan’s great seal, his coach drawn by eight horses, wherein were ten of the women of his seraglio; 74 pair of silver kettle-drums, all the grand seignior’s papers, and all the money that was to pay the army, which came to above 3,000,000 livres; and it is said, that the whole booty amounted to several millions of pounds sterling. In 1699 the peace of Carlowitch was concluded, and an end put at length to the war, which had lasted fifteen years: and it was a great satisfaction to Eugene to have contributed so much to the finishing of it by this famous victory at Zenta. He had passed the first years of his youth in the wars of Hungary; was in almost all the battles, where he had eminently distinguished himself; and it seemed now, that he had nothing to do but to enjoy at Vienna that tranquillity which is sometimes, although not always, relished by men who have spent their lives amidst the noise of arms and dangers. But this repose was not to last long. 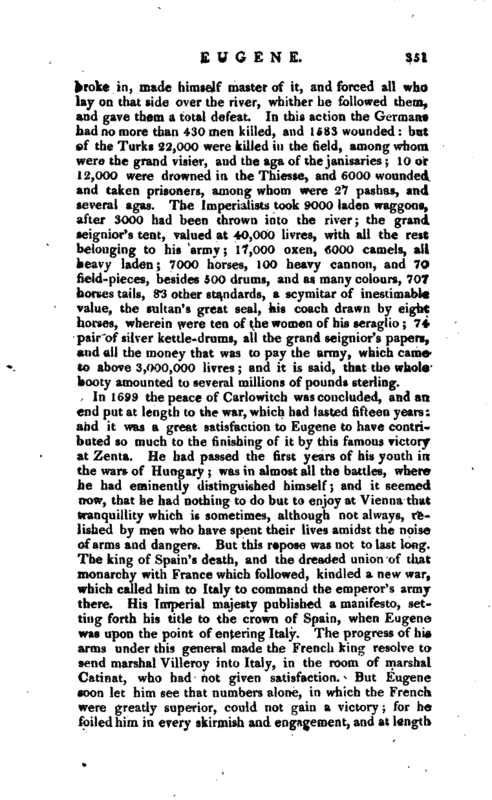 The king of Spain’s death, and the dreaded union of that monarchy with France which followed, kindled a new war, which called him to Italy to command the emperor’s army there. His Imperial majesty published a manifesto, setting forth his title to the crown of Spain, when Eugene was upon the point of entering Italy. The progress of his arms under this general made the French king resolve to send marshal Villeroy into Italy, in the room of marshal Catinat, who had not given satisfaction. But Eugene soon let him see that numbers alone, in which the French were greatly superior, could not gain a victory; for he foiled him in every skirmish and engagement, and at length | took him prisoner by a contrivance conducted with so much secrecy, that the French had not the least suspicion of it. Eugene went to put himself at the head of a body he brought from the Oglio, and ordered another to come from the Parmezan at the same time to force the bridge. He marched with all secrecy to Cremona; and sent in, through the ruins of an old aqueduct, men who got through and forced one of the gates; so that he was within the town before Villeroy had any apprehension of an army being near him. Awakened on a sudden with the noise, he got out to the street, and there was taken prisoner. At the instant that one of the German officers laid hold on him he whispered him, and said, “I am marshal de Villeroy: I will give you ten thousand pistoles, and promise you a regiment, if you will carry me to the castle.” But the officer answered him, “I have a long time faithfully served the emperor my master, and will not now betray him.” So he was sent to the place where Eugene was; who sent him to one more secure, under a strong guard. But, notwithstanding this, the other body neglecting to come up at the time appointed, an Irish regiment secured the bridge; and the design of capturing the garrison failed, although it was so well contrived and so happily executed on one part. Eugene had but four thousand men with him, and the other body not being able to join him, he was forced to march back, which he did without any considerable loss, carrying marshal Villeroy and some other prisoners with him. In this attempt, though he had not an entire success, yet he gained all the glory to which the ambition of a military man could aspire, and was considered as the greatest and happiest general of the age. In 1712, after having treated with the States General upon the proposals of peace then made by the court of France, he came over to England, to try if it were possible to engage our court to go on with the war, for it met with great obstructions here: but was surprised to find, the day before his arrival, which was on Jan. 5, that his good friend the duke of Marlborough was turned out of all his places. 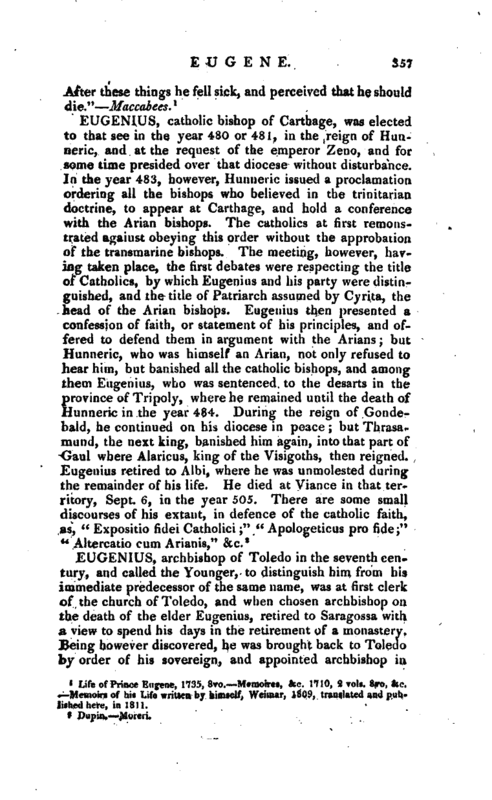 However, he concealed his uneasiness, and made a visit to the lord president of the council, and to the lord treasurer; and having had an audience of the queen, the day after his arrival, he paid his compliments to the foreign ministers, and the new ministry, especially the duke of Ormond, whose friendship he courted for the good of the common cause. But, above all, he did not neglect his fast friend and companion in military labours, the discarded general; but passed his time chiefly with him. He was entertained by most of the nobility, and magnificently feasted in the city of London by those merchants who had formerly contributed to the Silesian loan. But the | courtiers, though they caressed him for his own worth, were not forward to bring his negotiations to an happy issue; nor did the queen, though she used him civilly, treat him with that distinction which was due to his high merit. She made him a present of a sword set with diamonds, worth about 5000l. which he wore on her birth-day; and had the honour at night to lead her to and from the opera performed on this occasion at court. After he had been told that his master’s affairs should be treated of at Utrecht, he had his audience of leave March the 13th, and the 17th set out to open the campaign in Flanders, where he experienced both good and ill fortune at Quesnoy and Landrecy. In 1713, though forced to act only defensively on the Rhine against the French, who now threatened to overrun the empire, he nevertheless so signalized himself by his vigilance and conduct, that he obliged them to spend one whole summer in taking Landau and Friburg. 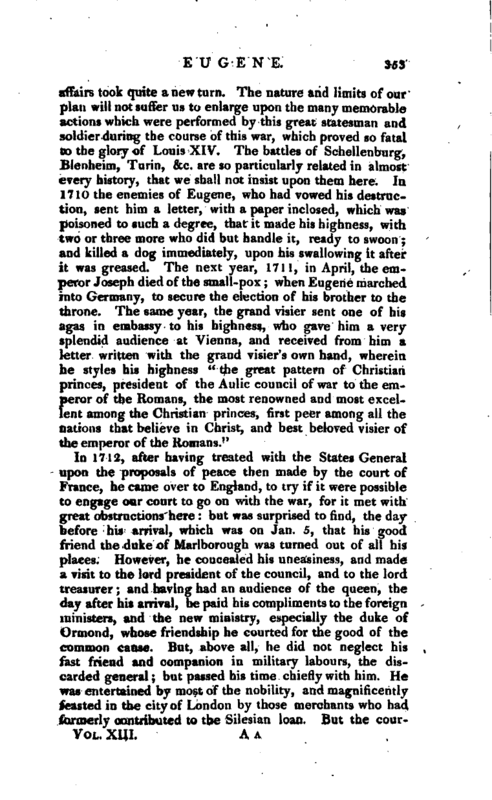 March 6, 1714, he concluded with marshal Villars, at Rastadt, preliminary articles of a general peace between the empire and France; which were signed by him, as his imperial majesty’s plenipotentiary, Sept. the 27th following, in a solemn treaty of peace, at Baden in Ergau: in which treaty he is entitled “The most high prince and lord Eugene, prince of Savoy and Piedmont, knight of the golden fleece, counsellor of state to his sacred imperial majesty, president of the council of war, lieutenant-general and marshal of the holy Roman empire.” Upon his return to Vienna, he was received with the loudest acclamations of joy by the people, and with the most cordial affection by the emperor, who presented him with a fine sword richly adorned with diamonds. He now seemed to have some respite from the fatigues of war but neither was this to last long: for, though peace was concluded with France, yet war broke out on the side of the Turks, who in 1716 began to make extraordinary preparations. Eugene was sent with the command of the imperial army into Hungary, attacked the Turks in their camp, and obtained a complete victory over them. He took the important fortress of Temeswaer, after the Turks bad been in possession of it 164 years; and next invested Belgrade, which he also took. After making peace with the Turks, he had a long suspension from those glories which constantly attended his rictorious sword: for, in the war which ensued between | the emperor and the king of Spain, count Merci had the command of the army in Italy, and Eugene had no share in it, any farther than in council; and at the conclusion of it, when he was appointed the emperor’s first plenipotentiary in the treaty of Vienna, in 1725. We next find him engaged in a new scene of action, in the war between the emperor his master and the kings of France, Spain, and Sardinia, in which, from 1733 to 1735, he experienced various success. 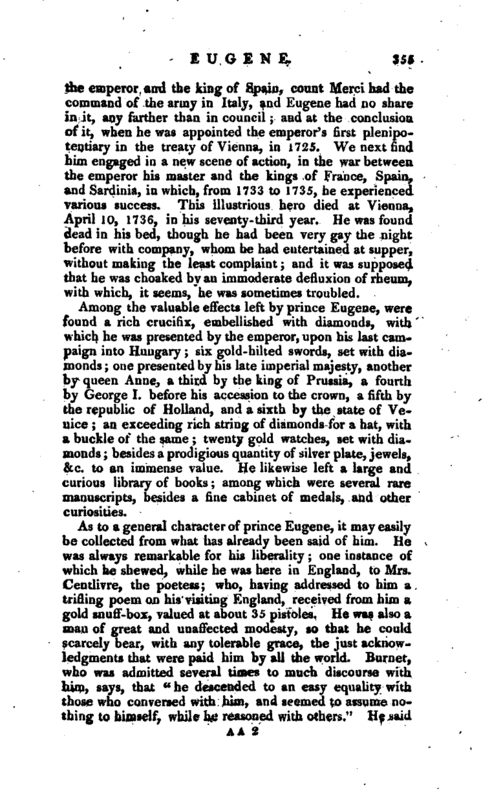 This illustrious hero died at Vienna, April 10, 1736, in his seventy-third year. He was found dead in his bed, though he had been very gay the night before with company, whom he had entertained at supper, without making the least complaint; and it was supposed that he was choaked by an immoderate defluxion of rheum, with which, it seems, he was sometimes troubled. Among the valuable effects left by prince Eugene, were found a rich crucifix, embellished with diamonds, with which he was presented by the emperor, upon his last campaign into Hungary; six gold-hilted swords, set with diamonds; one presented by his late imperial majesty, another by queen Anne, a third by the king of Prussia, a fourth by George I, before his accession to the crown, a fifth by the republic of Holland, and a sixth by the state of Venice; an exceeding rich string of diamonds for a hat, with a buckle of the same; twenty gold watches, set with diamonds; besides a prodigious quantity of silver plate, jewels, &c. to an immense value. He likewise left a large and curious library of books; among which were several rare manuscripts, besides a fine cabinet of medals, and other curiosities. Life of Prince Eugene, 1735, 8vo.—Memoires, &c. 1710, 2 vols. 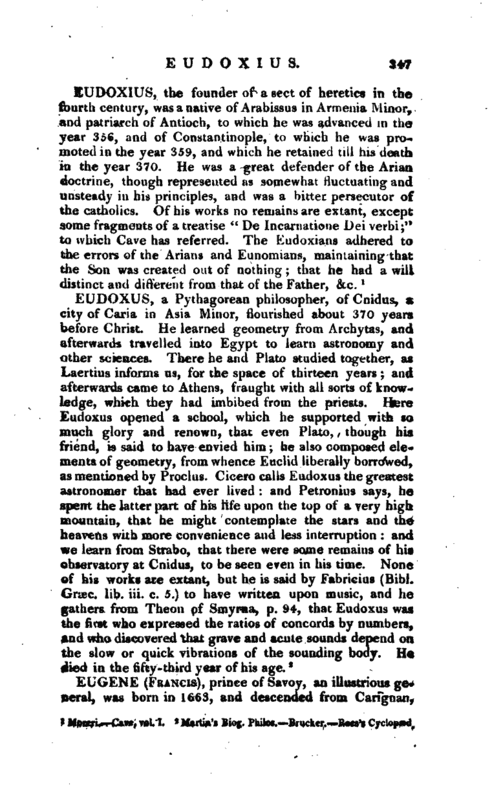 8vo, &c, —Memoirs of his Life written by himself, Weimar, 1809, translated and published here, in 1811.